As you may have recognized I chose friday as 'Restaurant Friday'; every week to every two weeks I will, as promised, post about a restaurant I really like. That restaurant may be in London, Barcelona or other cities I've visited. I hope I can help you a bit with that! This week it's Warsaw! This is definitely one of my favourite restaurants in Warsaw which my mom discovered several years ago when we went here for her birthday dinner. It has changed a bit since then and the food is steadily improving. They serve mainly traditional Indian and Thai cuisine but you can also find Nepalese and Chinese dishes - YUM! There are places inside where you can lunch and dine in a very cosy atmosphere, sitting on sofas surrounded by dimmed light. During summer there are several seats outside in a spacious patio. You don't see the restaurant when walking by, cause it's in a backyard...so keep your eyes open! There has been opened another Mandala further from the center, too, but I haven't been there so far thus I have no clue how it looks like. The food is really fantastic! I love their green and red curry, it's perfectly spiced and the meat is also very tender. Portions are fair, you just have to order rice or naan bread (try the garlic-spiced one, it's delicious) additionally because it's not included in the price. There are also lunch menus for about 6€..and believe me you don't walk out hungry. I also liked the Vindaloo chicken, very spicy but very tasty as well. With most of the dishes you can choose between chicken, beef, lamb or shrimps and there are some vegetarian dishes, too. 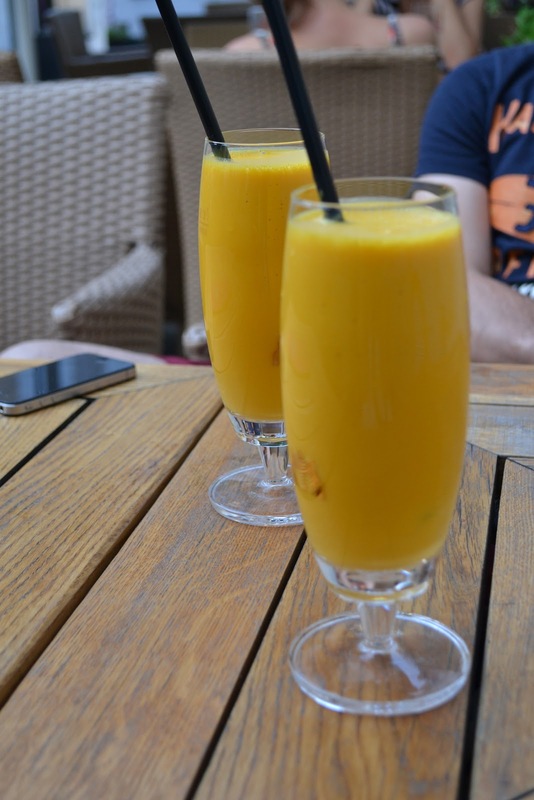 I recommend the Mango lassi, a very refreshing 'yogurt' drink. What's also nice about that restaurant is that during some night-hours it turns into a club. Enough the talking, try it out yourself and enjoy!! Click below for the German text!! Mandala, eines meiner Lieblingsplätze in Warschau. Das Restaurant serviert hauptsächlich indische und thailändische Gerichte aber auch chinesische und nepalesische Speisen sind auf dem Menü zu finden. Etwas versteckt in einer hinteren Garageneinfahrt fällt einem das Restaurant nicht sofort ins Auge, deshalb sollte man umso besser hinschauen, denn es lohnt sich! Ich kenne nur das eine Restaurant auf der ul. Emilii Plater, aber mittlerweile hat auch eins etwas weiter weg vom Zentrum eröffnet. Das Restaurant ist innen sehr gemütlich eingerichtet, in einem garagenähnlichen Raum (hört sich kurios an, ist es aber nicht ;)), wo man auf gemütlichen Sesseln und Bänken in einer ruhigen Atmosphäre sein Mittag- oder Abendessen geniessen kann. Im Sommer gibt es dann auch draussen Tische. Die Speisen sind sehr lecker, meiner Meinung nach perfekt gewürzt mit Chili, Ingwer, Knoblauch und Koriander (natürlich nicht in allen Gerichten). Man kann fast jedes Gericht mit Hühnchen, Rind, Lamm, Scampi oder vegetarisch bestellen. Mein Favorit war bislang das grüne und rote Curry und auch das sehr scharfe Vindaloo Chicken befand sich schon einige Male auf meinem Teller. Die Beilagen muss man extra bezahlen, also Reis oder Naan Brot - ich kann das Knoblauch Naan Brot empfehlen.. und als Getränk den Mango Lassi..wirklich sehr lecker und erfrischend! Abends wird das Restaurant dann zu einem Club. Ausprobiert habe ich das noch nicht, aber das werde ich sicherlich nochmal tun. Also, wenn ihr mal in Warschau seid, dann nichts wie hin!! !